What's next: The bills are expected to sail through the PiS-controlled Senate and land on the desk of President Andrzej Duda, reports the AP. In a surprise move, however, Politico reports that Duda wants to water down the measures before approving them. The rationale: PiS chief Jaroslaw Kaczynski, seen as Poland's "de facto leader" by the Economist, says the reforms are needed because the courts are "subordinated to foreign forces" and also too inefficient. 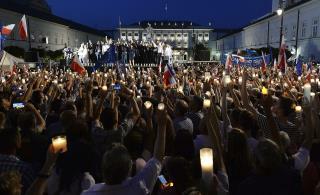 But critics say the PiS is looking to put into place a judicial rubber-stamp for its policies. 'Nuclear option': Because of the moves, the EU is close to triggering its never-before-used Article 7 against Poland. The so-called "nuclear option" could lead to the suspension of Poland's voting rights, reports the Guardian, though such a move requires the unanimous consent of member nations, and Hungary is unlikely to go along. The danger: A court system run by the government "could enable the government to falsify elections, to evade corruption investigations, to prosecute opponents," writes Anne Applebaum in a Washington Post column. Getting personal: In fiery debate in Parliament, an opposition member said that former President Lech Kaczynski—the late brother of the current PiS leader—would never have approved of such changes. "Don't wipe your treacherous mugs with the name of my late brother," Jaroslaw Kaczynski shot back. "You destroyed him, you murdered him, you are scoundrels." His brother was killed in a suspicious 2010 plane crash. That prompted another lawmaker to describe Kaczynski as "crazy with hate." The U.S.A. grants life long tenure to our most critical and influential justices out of a belief that their morality, patriotism and selfless devotion to American principles is inviolate but history puts a question mark on that. Recent history adds an exclamation point and another question mark. ?!? Funny how long it took people to realize.. PEOPLE DO NOT WORK TOGETHER unless they are FORCED TO by some means... But that is equal to the US supreme court... To some extent..